Regular readers of bangkokfitness.com will know that I’ve experimented a lot with my diet and nutrition in the last year, including meat, grains, dairy, juice fasting, caffeine, alcohol and food timing. A few months back I realised that I’ve never recorded the amounts I’ve eaten, only the types of food. When I’ve wanted to cut or gain weight I’ve relied on my intuition, which has worked fine for me but doesn’t work for everyone. I felt as though when eating normally without any weight loss or gain goals I consumed a lot more than the average person. This perhaps doesn’t impact me as much as your average person due to my high activity levels. The dated and very generic advice from the UK government is 2000 for women, 2500 for men. The UK Health Board are the last people I get my nutritional advice from, but it still interested me to know my caloric intake. Now there is a lot more to health, fitness, weight loss and looking good than ‘calories in, calories out’ (which we’ll visit in a later post) but calories do exist and they play an important role in weight management. So I decided to find out about my calorie and general food consumption in the only way I know how: a new food experiment! My challenge was to record everything I consumed in 7 weeks. And I mean everything – if I consumed a nut or licked an ice cream it went in the diary. I’ve done food diaries in the past but have come to realise that they can be useless and misleading, as they often don’t record amounts. For a general idea about the kind of foods being consumed they’re fine, but for many people a ‘general idea’ is not enough for a strong conclusion that they can really work with. 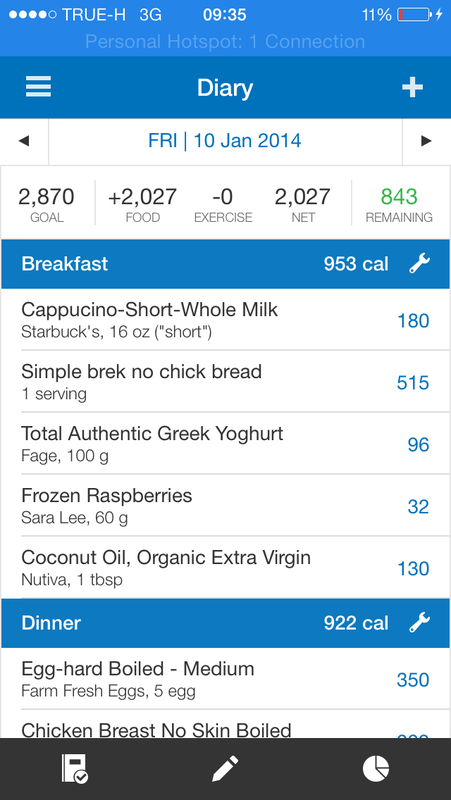 So for this experiment I enlisted the help of myfitnesspal, an app that helps you track food consumption. The advantages of using an app over simple notes are numerous, but the big one is that once you input your food it gives you facts and stats that would take hours to compile manually. 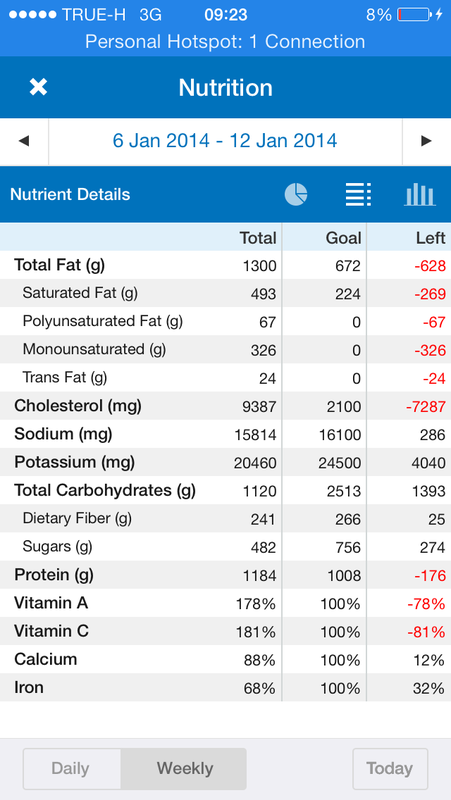 Calories, fats, carbs, proteins and nutrients are all worked out and you can view reports on various aspects of your nutrition. As well as providing solid information, it makes the whole process more fun and enjoyable, especially for a nutrition geek like me. It also provides a sense of community as you can add friends or use the forum, and if you open up your food diary others can see how you’re doing (including your trainer), which makes you accountable to someone beyond yourself. You can also set reminders to prompt you if need be. If you’re considering recording your food, an app such as this one is the only way. The first thing I’d like to say is that this 7 weeks consisted of ‘normal eating’. By normal, I mean what works well for me, and with compliance to the 80/20 rule in terms of balance (eat perfect 80% of the time, relax more for 20%). I wasn’t doing any other experiments or tests during this time. When you’re trying to input your three course meal into the app you realise how little you know about what you’re eating when you’re not making it yourself: quality of ingredients, amounts, extra ingredients such as MSG, salt and sugar, oils used, condiments… The list goes on. In these cases I just made an educated guess. Summary: the only way to have a complete picture is to measure and prepare your own food. I had days of eating where my calorie consumption far surpassed what I thought I’d had, and if I didn’t keep on top of updating I’d find it hard to recall exactly what I had eaten. This highlighted to me how easy it is to overeat and not realise it, even for someone like myself who is quite in tune with their consumption. Can’t manage your weight but think you ‘eat pretty well’ or ‘don’t eat that much’? Sorry, but you’re wrong. As noted above, written food diaries are too generic and often add to the confusion rather than solve it. I’ve had clients do them in the past and we’ve both been puzzled over why they’re not getting the desired results. I now realise that they’ve missed things out or haven’t given enough information. For example, a ‘Thai buffet’ could be anything from 200-2,000 calories. A ‘chicken salad’ could be anything from 200-800 depending on condiments, extras, sauces etc, and it tells us nothing about the quality of the ingredients. If you’re going to do a food diary commit to a week, more if possible, and record everything and do it properly. Otherwise, don’t bother. My clients who’ve been thorough with the process have had the best results by far. Unsurprisingly, incomplete diaries with entries and days missing have yielded little progress. Studies have shown that people who complete food diaries eat less and eat better. I wouldn’t recommend it as a long term strategy but if you have a big event or goal to aim for you may consider extending the time you do it. Even if you only do it for a week though, you will discover things about your eating habits you never knew and you will automatically become more conscious of the foods you’re consuming. The stats compiled by the app will enhance the educational process even further. I’d like to state loud and clear that this exercise should enhance your relationship with food, not make it worse. It is about learning how you fuel your body and educating yourself on your eating habits, with the view to making some positive changes that are sustainable. It is not about becoming obsessed with every little morsel that you’re eating. That’s not a healthy road to go down. For most people, 1-4 weeks is sufficient. This experiment was actually open ended for me, but I found that at a friends wedding I was offered a drink and my first thought was about putting it in the app. It was taking away from my enjoyment of the event and so I stopped there and then – 7 weeks was enough info for the time being and it was time to relax a bit! Ultimately, everyone should be trying to find out what way of eating works best for them. This includes what kind of foods you enjoy, how your body reacts to different food and the best and most realistic way you can balance and manage your food consumption in a way that’s sustainable and long term. Once you’ve built up a strong knowledge base, you can relax and enjoy optimal health without the need for food diaries and experimentation. A food diary is an essential tool to hold up a mirror to yourself and take the first step towards taking charge of your nutrition. Have you ever done a food diary? What did you discover? Please comment below. I’m in the middle of a month of veganism, which is proving to be my biggest and most challenging food experiment yet. I’m learning a lot and will update you guys soon. As always, please feel free to leave any comments below. This entry was posted in Articles, Bangkok Specific by jackthomas. Bookmark the permalink.